Three recipients of the NACUBO 2018 Excellence in Sustainability Award share their approaches to growing resilient and environmentally responsible communities. NACUBO honored three institutions—the University of California, Los Angeles; the University of Texas at Arlington; and the University of Minnesota, Morris—with its 2018 Excellence in Sustainability Award. The award recognizes institutions that have demonstrated excellence and innovation in sustainability leadership areas, including finance, facilities, operations, environmental, community, and climate. These three institutions are making investments in sustainability to increase energy efficiency, promote collaboration in their communities, and create advanced academic opportunities. In an interview with Business Officer, leaders from each institution discussed their sustainability efforts and future plans. When she calls the Sustainable LA Grand Challenge “groundbreaking in its scope and scale,” Nurit Katz isn’t exaggerating. “It is our goal that by 2050, Los Angeles County—the most populous county in the nation—will power 100 percent of its energy and transportation needs with renewable energy and use 100 percent locally sourced water, which will enhance the health of our ecosystem,” says Katz, chief sustainability officer and executive officer for facilities management, University of California, Los Angeles (UCLA). She explains that a project of this size requires a multidisciplinary and multisector approach. The LA Sustainability Leadership Council, co-chaired by UCLA Chancellor Gene Block and Los Angeles Mayor Eric Garcetti, brings together numerous regional organizations invested in advancing the region’s sustainability goals, such as increasing electric transportation options, using more local water, creating more accessibility to green spaces for all Los Angeles residents, and strengthening the city’s resiliency to handle natural disasters and climate change. The council provides vision, guidance, and support for the grand challenge, the Sustainable City pLAn, and other sustainability initiatives. What is the Sustainable LA Grand Challenge? This initiative brings together more than 150 faculty experts from across disciplines and 30 research centers to create innovative research projects that are critical to transforming Los Angeles County into the first sustainable megacity. The project is spearheaded by Mark Gold, associate vice chancellor for environment and sustainability, and Cassie Rauser, director, Sustainable LA Grand Challenge. It is a major universitywide undertaking, and we are working closely with local government agencies. Although this is an extremely ambitious project, the university is well-positioned to tackle this initiative. 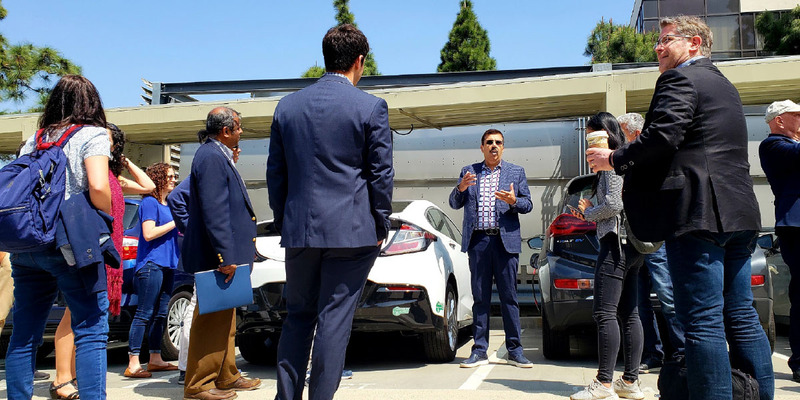 Professor Rajit Gadh leads a tour of the microgrid for the LA Cleantech Incubator. As part of his research, the University of California, Los Angeles offers more than 150 electric vehicle charging stations on campus. How are students involved in the institution’s sustainability efforts? We currently have 40 student sustainability groups working on various efforts. Some have a broad focus—such as E3: Ecology, Economy, Equity—which is one of the largest environmentally focused groups on campus. Other groups such as the Renewable Energy Association, which has mostly engineering students, have a more specific focus on solar, wind, and other renewables. Students are also involved in the Sustainable LA Grand Challenge through an undergraduate research scholars program that is focused on urban sustainability solutions. Students design group projects to address and complement sustainability on campus. How are you bridging sustainability and academics? At UCLA, we are trying to find synergies between the research mission and the operations of the university. We are also using the physical campus as a testing ground for innovative ideas and technology. We’ve had a variety of successful projects. 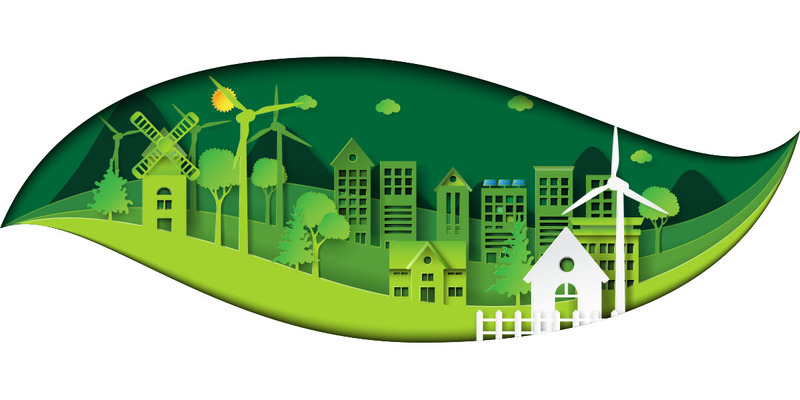 For example, Magali Delmas, a professor at the Anderson School of Management, conducted a project on energy conservation behavior that monitored energy use in student housing and looked at different messages that are successful in reducing energy consumption. On the student side, for the last 10 years we have operated an award-winning program called Sustainability Action Research. It’s a two-quarter academic course through the Institute of the Environment and Sustainability. Eight teams of four to five students are paired with campus faculty for hands-on, applied research activities. They’ve examined everything from food waste in the residence halls to biodiversity on campus. In a recent project, students designed a storm water capture system, and successfully secured funding. The system is currently being installed at a campus parking structure and will reduce campus water use and increase resilience. UCLA made changes to its dining services. How does that help with sustainability efforts? By 2020, we want to have 20 percent sustainable food purchasing. Currently, we seek local, organic, and sustainable food procurements and innovative pilots. For example, we recently installed 50 hydroponic vertical towers that produce lettuce and herbs for the dining hall. One dining hall, Bruin Plate, focuses on healthy and sustainable food. And the Semel Healthy Campus Initiative Center, which prioritizes the health and wellness of the campus community, is a campuswide effort that aims to make UCLA the healthiest place to work, learn, and live. The University of Texas at Arlington (UTA) has advanced water conservation both in the region and on campus with The Green at College Park, “a public space that has a dry creek and ecological retention area that manages storm water and rainwater,” says Meghna Tare, executive director, UTA’s Institute for Sustainability and Global Impact. The park is just one of UTA’s many sustainability and energy-efficient initiatives. Other green projects and collaborations include serving as a regional partner with the Air North Texas initiative to reduce ozone pollution, installing a rainwater collection system and low-flow showerheads, and serving as host and sponsor for the North Texas Regional Water Conservation Symposium. Explain how The Green at College Park contributes to the institution’s sustainability initiatives. The park is an area that students, faculty, staff, and visitors can all enjoy. It features a large lawn with drought-tolerant grass and a curved stone wall perfect for casual seating. The landscape plants in the park consume 70 percent less water than those typically grown in the area—our plants use what nature provides. Recycled glass was used in the pavement, which makes it permeable. It also has dry creek and ecological retention areas that manage rainwater and storm water runoff that drain into Johnson Creek. The park is certified by the Sustainable SITES Initiative, a certification similar to LEED, but focused on landscape design. 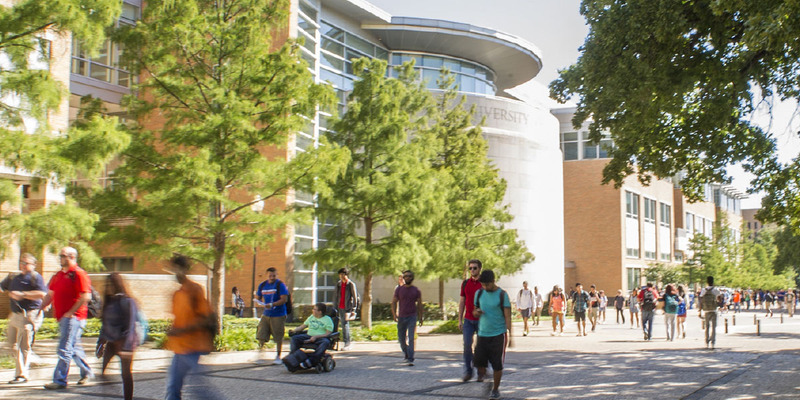 At the University of Texas at Arlington, students can enroll in an 18-credit-hour environmental and sustainable studies minor. Explain UTA’s involvement in the annual North Texas Regional Water Conservation Symposium. The symposium is a collaboration among the Tarrant Regional Water District, Dallas Water Utilities, and North Texas Municipal Water District. It brings together water professionals from the region and offers programming related to strategic planning, innovative water education, conservation plans, and other water-related topics. For several years, UTA hosted the symposium on its campus and was a sponsor of the event. How do the institution’s other water-saving efficiencies help the UTA campus? In 2006, we started installing low-flow showerheads. By summer 2011, we installed 1,500 showerheads, and we now save 27 million gallons of water annually. We also installed a 28,000-gallon rainwater collection system at the engineering research building. It captures condensation from the air conditioning system as well as rainwater, which is then stored for use in landscape irrigation. What is the organic community garden, and how does it work? We started the garden in 2010, after being asked by the city of Arlington to provide green space. As part of our commitment to community engagement, we wanted to create a community garden. The city provided the funding and we provided more than half an acre of land, which was divided into 70 small plots. Plots are filled on a first-come, first-served basis, and participants pay a $35 annual membership fee, which helps to pay for water costs and other supplies. Members grow items of their choice, but they mostly plant cucumbers, zucchini, tomatoes, cauliflower, basil, and fruits. The University of Minnesota (UMN), Morris, and the greater Morris community—a town with a population of 5,300 residents—are teaming up to create a model for sustainability. Can you describe the type of experiences students have? Herrmann: Our students work on sustainability issues on multiple levels. Troy Goodnough has interns who are working on developing education programs for young kids, as well as adults. We have students in computer science studying how to capture energy data and use it to benefit the campus. Other students are examining our energy assets to better understand how they influence our campus. These are skills that students will take with themselves, whether they continue to work in sustainable energy, go into project management, or become teachers. Two wind turbines provide approximately 60 percent of the electricity used by the University of Minnesota, Morris campus. As a small institution, why do you focus your efforts on sustainability? Herrmann: We care about the environment and we want to help our community. In addition, our students have been the drivers pushing for sustainability. I think about our campus compost system—which was student-driven and is student-operated—that has recycled 100 tons since 2011. Now, our sustainability efforts have become the model for the local public school. Yes, we’re a small, public liberal arts institution, but these issues are larger than our community—they are international. We need to help people understand that sustainability has an impact on our community and the world. Goodnough: The institution has played an important statewide leadership role in sustainability. Our campus partnered with the Jefferson Center and the Institute for Agriculture and Trade Policy in June 2014 for the inaugural Rural Climate Dialogues in Minnesota—a three-day moderated study and deliberation forum. We convened a group to discuss how to prepare for Minnesota’s changing weather, which is becoming more extreme (i.e., hailstorms and frequent rainstorms). During the meeting, we developed our first community-based resilience plan. How does the institution pay for sustainability efforts, and does it generate revenue? Herrmann: We’ve used multiple strategies for our projects. For example, we have two wind turbines. 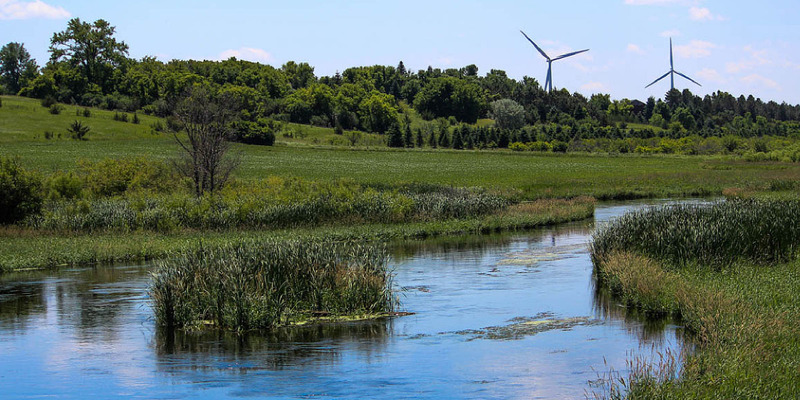 The first was funded through a grant from the state of Minnesota for wind development. The second was financed with a bond. Altogether, the two turbines produce approximately 60 percent of our electricity on campus. In terms of revenue, we aim for cost avoidance, which means that the amount that we would pay to the power company is instead used to pay off the loan. Anything that we sell back to the grid we apply to maintenance operations and the loan. Goodnough: Each turbine is a 1.65-megawatt wind turbine, and the two turbines produce 10 million kilowatt hours a year. The UMN Morris campus only uses about half of the energy generated. The remaining five million kilowatt hours are exported to the power company, which helps to meet our state’s renewable-energy standard.